Sorry, no Cake Pop Tutorial today. I’m trying to get some new ideas and I’d love your help! If you have anymore suggestions, please enter my 5,000 Facebook Fan Giveaway and let me know! In the meantime, if you are planning on making cake pops as a gift for someone, here’s how I’ve been making my cake pop containers. 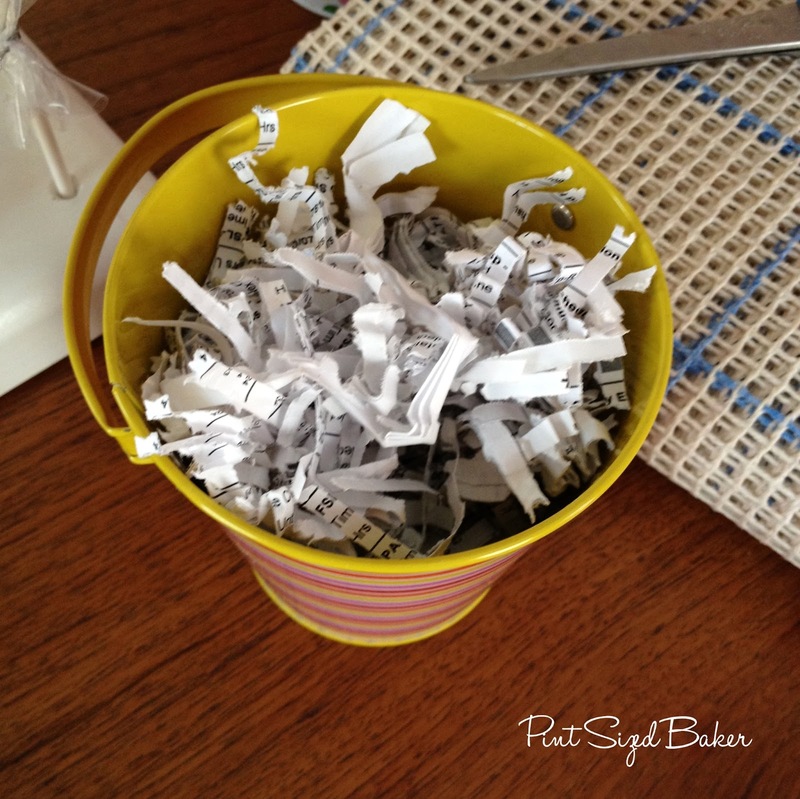 Put the ugly shredded paper into the metal bucket. My ugly shredded paper is right from my paper shredder. Yep, they are my shredded bills and documents. Fill up the bucket. The weight of the pops will squish it down. You can always add more/less as needed. Next, take the Rug Hooking Canvas and cut out a square that is larger than the top of the tin. The canvas is marked and I cut out a square on the blue lines. It’s about 4 x 4 inches. Cut in from the corners, but not all the way to the center, creating triangles. 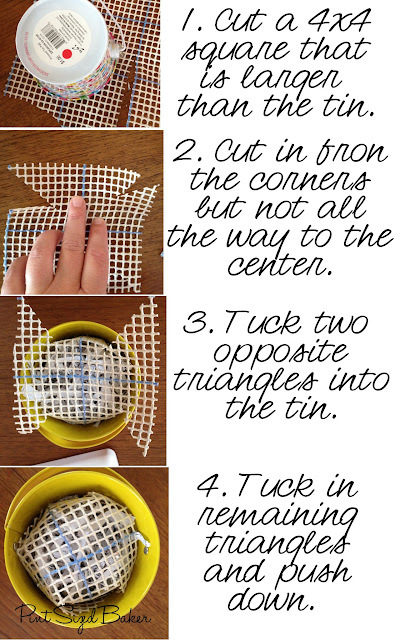 Take two opposite sides and tuck them into the tin surrounding the shredded paper. Tuck in the other two sides and push down approximately 1/3 to 1/2 of the buckets height. Now you can add your cake pops. These cake pops are on 6 inch sticks. If they were taller, I’d use a taller bucket. Also, these buckets are small, so I generally only add 6 cake pops. 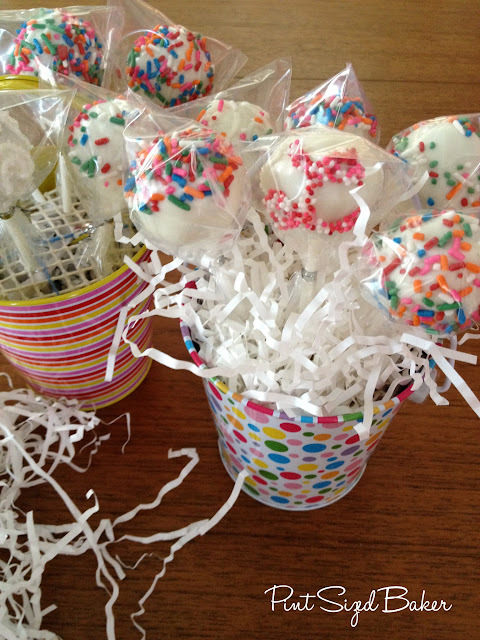 You can get a dozen into the bucket, but it’s a tight fit and you can’t “see” each cake pop. The canvas holes are large enough to get standard lollipop sticks through. The thicker cookie pop sticks won’t work. 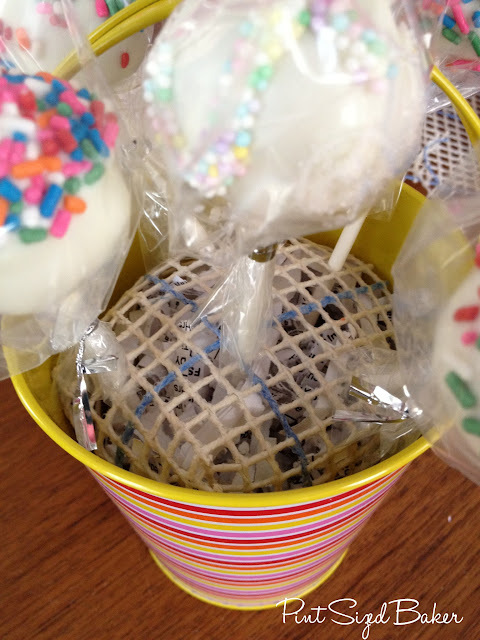 The shredded paper on the inside will stabilize the cake pop so that it doesn’t have to rest on the edge of the bucket. Finally, add the PRETTY shredded paper to cover and decorate. Just a word of caution – These bucket are TOP HEAVY! They will easily topple over. If you want more weight on the bottom to prevent this, you can add some marbles, sand, sugar, etc. and cover with the shredded paper and canvas. I know a lot of people use floral foam or Styrofoam, but, for me, that costs lots of money and I hate green fuzz at the end of my sicks! I hope this helps ya! I love this idea!!! Thank you Karyn!!! I like the idea of something from a book- character from a popular children's book like Charlotte's web or something…. 🙂 Thanks for the giveaway! Love how you gift these, by the way! I would love to see some springtime cake pops!! Yours are sooooo cute….ACC tournament is coming up…hopefully some Carolina Blue will be called for…how cute would that be, NC basketballs! Oooh! Make a guitar. And then send me a bunch by the 23rd, mmkay? 😉 KIDDING. id like to see barbie themed cake pops! 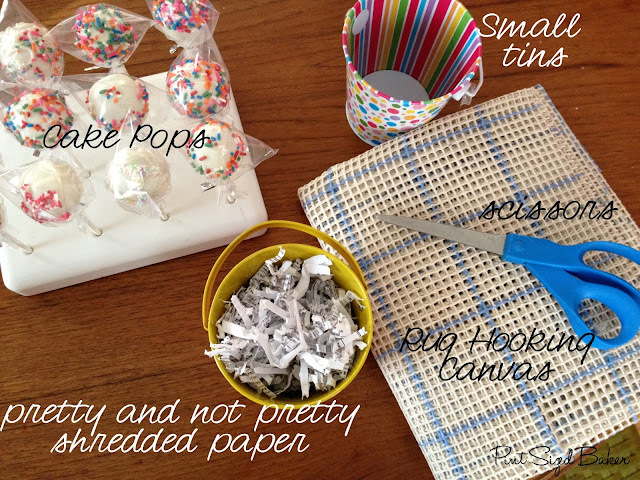 I would never have thought to use rug hooking canvas to keep the cake pops in place. Great idea. I'd love to see how you made butterfies out of chocolate/melts. I believe I saw some that you did long, long ago. Great idea.. thanks for sharing!! I'm have a Star Wars angry bird party in April..would love to see that! Aslong as they are PINK I would like them with no chocolate. What a very cool idea. Buying the plant foam frog stuff can be expensive and messy. You're always helping us out. Love it and Thank you!!! Okay, the canvas is brilliant! This is super cute! 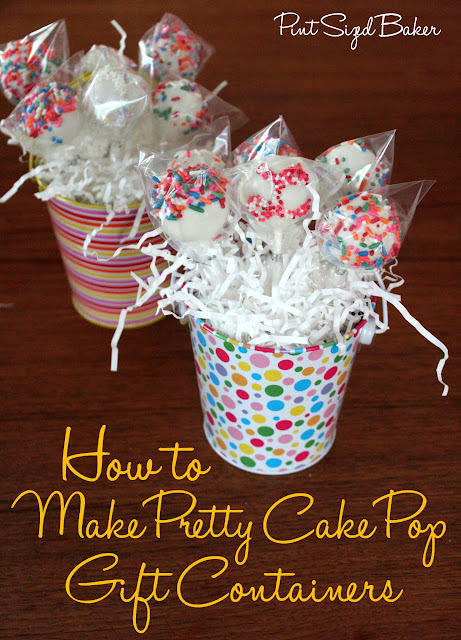 With the popularity of cake pops, it's very useful, too. Thanks for sharing at Pinworthy Projects. This is one of those nice ideas that will always come in handy. Thanks for sharing it. This is such a cute idea. Saw you at the What's Cookin' Wednesday. Can I just say….I LOVE YOU!!! Just finished making my container using rice as a weight and the rug canvas. Works beautifully! Genuis!!!! Thanks so much!